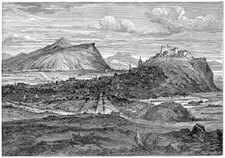 Cassell's Old and New Edinburgh by James Grant was printed as a periodical in the 1880s and is now seen as a set of three or six volumes, and describes its history, its people, and its places by using anecdotal historical text with endless illustrations. These volumes were a gift from my uncle, Bill Smith. As someone who has lived in Edinburgh for more than 50 years, the illustrations still thrill and excite me no matter how often I look at them. For this reason I wanted to put them online in such a format that Edinburgh school children and students might easily download the images or text whilst researching the history, architecture, society of Edinburgh's Old or New Towns. NEW! You can now browse and search the complete collection of John Kay's Original Portraits and Caricature Etchings, Memorials of Edinburgh in the Olden Time, and Edinburgh Past and Present on the Edinburgh Bookshelf. 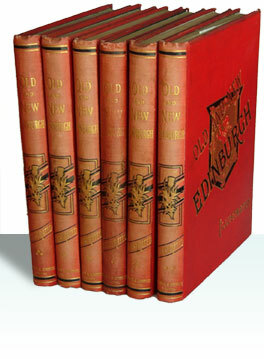 All six volumes of this beautifully illustrated set are now available online. You can search the text and read and print pages. You can also download, email or print any of the many excellent images. See what other readers are interested in. The following is a live-updated list of the ten most popular searches in Old and New Edinburgh.